I am fifty-six years old and my first memories of Great Books programs are seeing the sets of books at our home in the early 1960s. My parents were in a Great Books group that at that time met at the downtown Atlanta library. Both of my parents were huge readers, high-level thinkers, and heavy debaters (their friends were flaming liberals and at the time, my parents were very conservative, so good discussion skills were imperative!). As a child, I remember overhearing many heated and far-reaching discussions about everything from civil rights to communism to atheism. In retrospect, their group was extraordinary. I don't think it is common today to see friends whose political or social views are so different spending the kind of time together that this group did. Perhaps the tools that they were using in their Great Books discussions translated well into their other discussions in life and created an atmosphere of respect, a protective "rules of the game" structure that allowed them to have these diverse, fiery, outrageous disagreements with one another and remain fast friends. Maybe the literature in Great Books gave them common ground and language for expressing and analyzing their opposing ideas or supporting their views. Whatever it was, I believe it would be extraordinary in most social circles today. 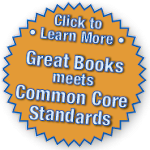 I was introduced to Great Books as a reader when my mother and several of her Great Books buddies brought the program to our elementary school. I was in maybe sixth grade at the time. In elementary school I was in the post-Sputnik, accelerated "special" classes. "Special English" involved diagramming sentences, which I loved, but not much literature. The only memory that I have of literature of any kind in these first years of school is listening to a second-grade teacher read Charlotte's Web and The Secret Garden aloud after lunchtime. It was my favorite time of the school day. In our home, my parents shared the d'Aulaires' book of Greek myths, Grimm's fairy tales, Giorgio Vasari's Lives of the Artists, and stories of famous musical works such as Peer Gynt, but we never encountered these in school. Book discussion, or really any kind of interpretive reading, was just not part of the curriculum. Perhaps this void was recognized by the adults who brought Junior Great Books to our school, or maybe it was just their personal enthusiasm for the program that motivated them. I think it was more likely the latter, because their obvious joy and engagement with the text and with us as new readers (interpreters) infused our meetings with a kind of passion that was recognized and remembered by the students who were involved. Several adult friends who participated in that program at the time later told me that it was the first time in their lives that an adult had interacted with them as though they had an adult mind, able to find meaning and grasp adult concepts in literature. I believe that the Shared Inquiry method, practiced well (as it was by these adult leaders), was the true reason for this feeling of respect. When a leader presents to the group a genuine interpretive question, one that the reader cannot answer immediately or has no preconceptions about, there is an atmosphere of respect that doesn’t exist in other discussion formats. I believe that this feeling of respect for the thoughts of others and for the author's words is the power of the program. I remember those wonderful, even a little awe-inspiring, hours we spent in the auditorium of our old WPA school, digging in to the deeper meanings of words and ideas in the kind of literature that most of us would not encounter again until our college years, if ever. We learned how to formulate interpretive questions and identify other types of questions, and we were required to read each selection twice in order to participate in a discussion. One adult friend told me that he will never forget having to sit out a discussion because he had only read the selection one time (we were so honest! ), but he also said that it never happened to him again. We cherished those times. When I meet other grammar-school friends who were involved in Great Books, they speak about the experience with the same kind of reverence for how it shaped their way of thinking and talking about a text, their understanding of how to approach a piece of literature, and their adult reading choices. The Shared Inquiry method that we encountered as adolescents—learning to formulate authentic questions that we did not have the "right answer" to, learning to withhold judgment as we worked with our peers to analyze a text and improve our comprehension—had a profound and powerful impact on us and certainly shaped our educational choices and interactions with other texts and thinkers. Aristophanes, David Hume, Joseph Conrad—these were some of the Junior Great Books authors of my elementary school years. I was a philosophy major in college, and there was nothing in my education, before or after Great Books, that prepared me for the kind of rigorous thinking, critical reading, and interpretive discussion that is fundamental in philosophy. In fact, my experience with Great Books was probably the primary reason for my interest in the ideas and literature of the great thinkers in the first place.